Friday, November 28th: After very successfully stuffing myself on Thanksgiving, yesterday, it was time to hit the roads. A nice day in early afternoon turned chilly and cloudy as the day wore on. The deer must have sensed that the weather was changing as they were many to be seen. Do you have a Confente? Do you know someone that does? A registry for Confente bikes has been announced. Email info@confente.org for more information, or for registering your Confente (should you be so lucky!). 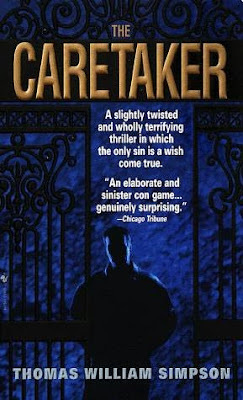 The registry will be at http://www.confente.org/. "For some time vintage bike collectors have lamented the lack of a Confente Registry. A Confente Registry is now being established. The Internet Domain Confente.org has been acquired for this purpose, and factual as well as photographic information on Confente bicycles, and on Mario Confente himself is being sought. 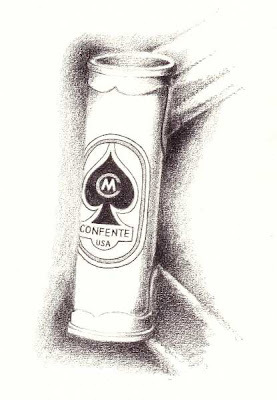 For the moment, the Confente Registry will be limited to only those cycles made by Mario Confente and labeled as Confentes. 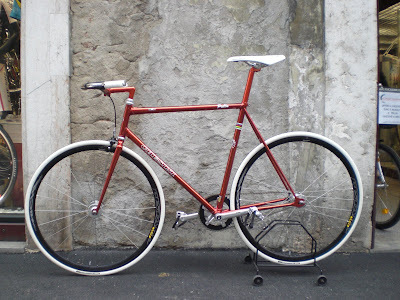 The Confente Registry will not currently include bicycles made by Mario Confente and sold under other names. The information received will be available, gratis, on the internet. The format of the Confente Registry will be similar to that currently used in other vintage bike registries.The Confente Registry will also publish original information and photographs relating to Mario Confente, some of which have only recently become available.What is now sought from owners of Confente bikes is: the bike's serial number (if apparent), the date manufactured (if known), the dimensions and type of bike (strada, pista, etc. ), the color(s) of the bike, the gearing group, and any special features (pantography, etc.). Needless to say, any other information on Mario Confente and his bikes will be gladly accepted. The name(s) of the owners of the bikes inserted into the registry may be listed or kept confidential if so desired.The Confente Registry will be non-profit, however, links to other relevant sites and organisations maybe made available.Any and all information should be sent to info@Confente.org"
This is a photograph of a photograph; I took it during a visit to Mario Confente's sister in Verona in March, 2008. Search within my blog for CONFENTE and you will find my story of that visit. 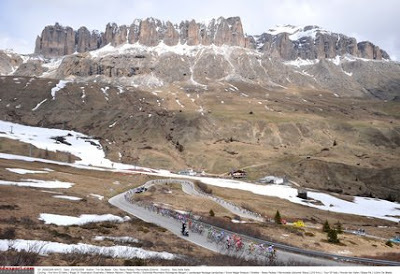 PROCYCLING's photographer Tim De Waele, has selected his favorite images of the 2008 season in Procycling's Review of the Year issue (December).Featuring among the gallery of Tim's best of 2008 are spectacular shots from the Giro, Tour de France, one-day classics, etc. Early Colnago Bikes, "La Freccia"
1950/1951 pg. 24 "let's make it clear that the bike he used was not a bought one. 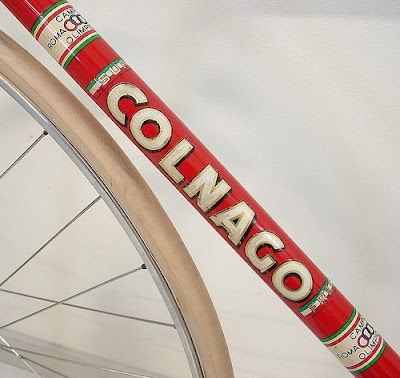 He had made it himself and it had Colnago Ernesto stamped on it." date not specified pg. 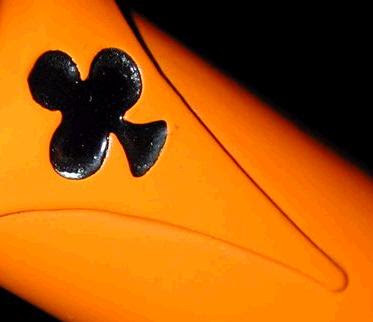 27 "first Colnago model came out under the name La Freccia" (the arrow). 1960 (approximately) pg. 27 "first foreign customer, "let's say 1960", was from Berkeley, California"
1970: Colnago created the flower/club logo after the Dancelli win in Milan-San Remo. This would indicate that the playing card with club logo's cannot be earlier than 1970 although they are often listed as 1969. 1964 thru 1973: pg. 29 "at Molteni he is already offical supplier: the bikes are called MOLTENI by express wishes of the owner but they are obviously Colnago's". Monday, November 24: It was a "heat wave" today compared to yesterday, reaching 41F. With freezing rain moving in tonight I decided to get a ride in. Having seen a black bear behind my home a few years ago I wasn't surprised to see the BEAR RESPONSE vehicle from the New Jersey Division of Fish and Wildlife along my route responding to a homeowner; the division is responsible for managing the growing black bear population and responding to black bear complaints. The American Black Bear is native to New Jersey and is the largest land mammal in the "Garden State". New Jersey's adult male black bears weigh on average 400 pounds; their weight can range from 150 pounds to over 600 pounds. Adult females weigh on average 175 pounds; their weight can range from 150 pounds to over 400 pounds. Adult black bears are about 3 feet high when on all four paws and can range from 5 feet to 7 feet tall when standing. Black bears can be many different colors, ranging from brown to black. Most black bears in New Jersey are black, but there has been one documented black bear in the state that is cinnamon brown in color. Prior to European settlement, black bears lived in forested regions throughout the state. Native Americans, such as the Lenni Lenape, used the black bear as a natural resource for items such as food, shelter and medicine. As European settlement occurred throughout the state, forests were cleared for farming, lumber, and towns. Black bears came to be regarded as vermin because of damage to settlers' crops and livestock. Loss of habitat and indiscriminate killing caused the black bear population to sharply decline throughout the 1800s. By the mid-1900s, fewer than 100 black bears remained and these were limited to remote northern areas of the state. Since the late 1970s the Garden State's black bear population has been increasing and expanding its range from the forested areas of northwestern New Jersey both southward and eastward. The growing population was primarily due to increased black bear habitat as agriculture lands reverted to mature forests, protection afforded by game animal status, and increasing bear populations in Pennsylvania and New York which pushed animals into the state. Today, an estimated 1,600+ black bears can be found throughout the state with the primary bear range being that area north of Interstate 80 and west of Interstate 287 in Sussex, Warren, Passaic and Morris counties. 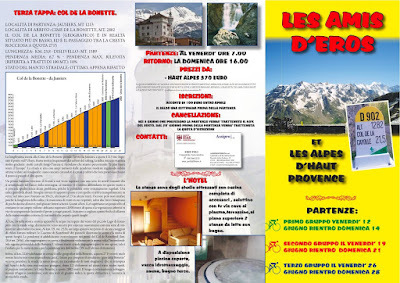 "les amis d'Eros et les alps d'aut provence"
My friend Eros Poli has laid out the June, 2009, schedule for his cycling weekends from Verona. This time he's off to Provence. 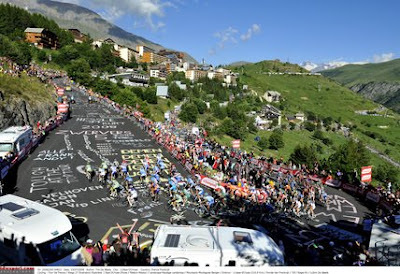 The trips I did in 2006 (Mont Ventoux) and 2007 (Galibier, Alpe d'Huez and Izoard) were fantastic as you are truly immersed in the experience of riding, eating, drinking, and having fun with Italian cyclists, all organized and led by Eros. Price is 370 Euro including transportation, lodging and meals. He can email you a pdf file of the brochure pictured above. Please search POLI within my blog for stories and photos of past trips. 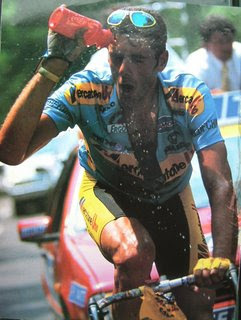 The last photo above is of Eros on his way to winning the Mont Ventoux stage of the 1994 Tour de France. This blog entry is written by cycling friend "Bill" (the masked man in orange sunglasses), and known to the literary world as Thomas William Simpson, author of several highly regarded novels. Sunday, November 23rd: coming soon! Unraveling the Mystery of the Colnago "Clubs"
"The Dancelli bikes are named for Michelli Dancelli, a professional racer from the late '60's and early '70's. 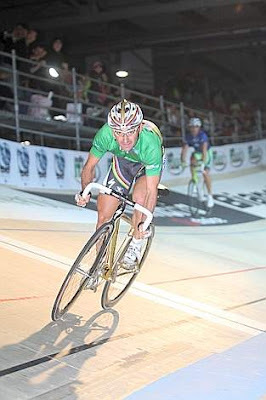 He rode for the Salvarini and Molteni teams. At Molteni he was a road captain for Eddy Merckx. 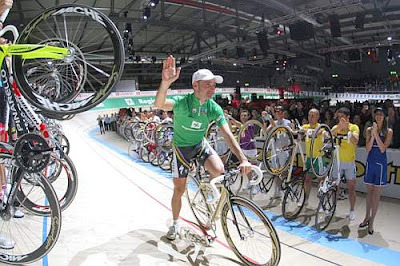 His most famous win was the Milan-San Remo while at Molteni. 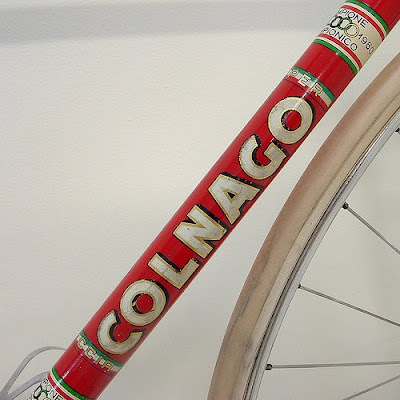 At the time the team was riding bikes made by Colnago. 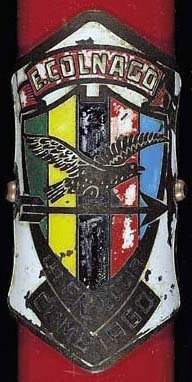 The Dancelli family crest had a clover leaf on it, before Dancelli's win in the Milan-San Remo Colnago did not have a "brand", in honour of Dancelli's win at San Remo Ernesto Colnago adopted the clover leaf to represent Colnago and that is still used to this day." However, from two important books about Ernesto Colnago we discover that the Dancelli family crest had nothing to do with the origination of the clubs (or clover leaf as it is also referred to). "For the present trademark, the ace of clubs, we must wait till 1970 when Michele Dancelli won the Milan-Sanremo on a Colnago, ending a 17 year famine that had lasted until Loretto Petrucci's double. The ace of clubs (trans: known as the ace of flowers in Italian) was an idea that came to Colnago, a man easily moved, by momentous occasions, the next day while reading the Gazzetta dello Sport. Bruno Raschi had produced one of his usual imaginative pieces, simple but effective. It revolved around Sanremo "city of flowers", and the picture of a cavalcade through two continuous streams of people packed together to cheer the long awaited Italian victory. 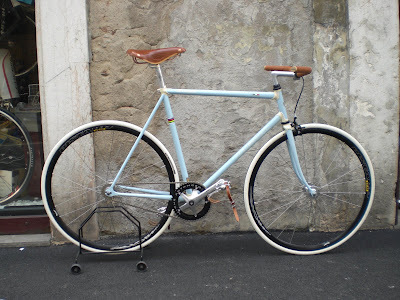 Raschi wrote of a bicycle in full bloom surmounted by Dancelli, effortless, light as a feather. So Colnago created the flower with just a C in the centre, the one that still appears today...."
Further, a well known collector wrote to me saying, "Ernesto Colnago has stated that the inspiration for changing his logo to the Ace of Clubs was the result of Michele Dancelli winning the'70 Milano-San Remo for Molteni while riding a Colnago. "LaPrimavera" (the Spring) is the nickname for Milan-San Remo and the Ace of Clubs represents the spring flowers. Steven Maasland (ed. note: a well known collector that is also bilingual in English/Italian) previously elaborated about the club/flower tie in: "The 'asso di fiore' is correctly translated as 'ace of clubs', however there is also a double entendre in Italian that is lost here as 'Fiore' is also 'flower', the symbol of the San Remo area. After the San Remo race win, Colnago spoke to the very well-known Italian sports reporter, Bruno Raschi, who was preparing his race report. He came up with the saying that the 'in fiore' bike won the race.This was a play on the fact that the race known for the 'riviera deifiori' (flower coast) as well as 'in fiore' (flowering or blooming). That particular race win was very important for Italian cycling because it was the first San Remo race won by an Italian in many years, hence the 'flowering' part in the 'flower' race." I edited the following article a bit to target it for general road riding during daylight hours. Do they outfit themselves and their bikes for cold weather riding or store their wheels for the winter? The days of riding in jerseys and shorts are gone. 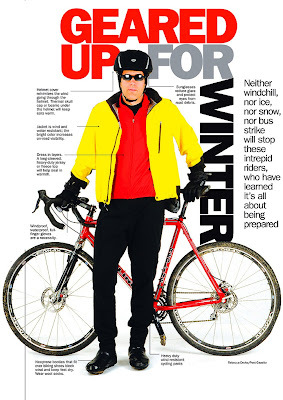 As the temperatures drop, the number of layers bicyclists need to wear to stay warm goes up. To get a cross-section of advice on cold weather bicycling, I spoke to Peter Greninger of REI on the South Side, Barry Jeffries of Dirty Harry's Bicycles in Verona, Bob McKinney of Iron City Bikes in Oakland, Kevin Peters of Trek bike shop in Shadyside and Brad Smith, a retired meteorologist who owns Confluence Cyclery in southern Somerset County. Here's a summary of their advice. Bicyclists should wear a skull cap under their helmets to prevent heat loss. The thickness of the cap depends on how cold it is. The helmet vents, wide open during hot weather, should be closed or covered with tape. If the tape reflects light, so much the better. A balaclava, which covers the head, ears and neck and has an opening for the eyes and nose, is ideal for cold weather. It typically is made of wool, though some may be made of acrylic, cotton or fleece. If it becomes too warm, the scarf portion in many models can be rolled up into the hat. Sunglasses with a dark tint for bright snowy mornings will help to reduce glare and protect the eyes from ultraviolet rays and debris. A pair of goggles is a good idea on windy days and when the temperature drops into the single digits. The layering concept that applies to other sports holds true for cold weather biking. And some of the same clothing used for downhill and cross-country skiing and snowshoeing can be worn for the sport. A complete set of long underwear that wicks away moisture from the body is the first layer. A vest with a mesh back for ventilation or a thermal jersey goes on next. It can be covered with a fleece top and then a brightly colored jacket with ventilation zippers under the armpits. A pair of fleece-lined tights with zippers at the ankles goes on next. Look for tights that are articulated for movement and have front panels that are windproof and waterproof. A fleece gaitor protects the neck and can be pulled up to cover the mouth and nose. A full face mask will prevent frostbite when the temperatures plummet. Full-finger gloves that are windproof and waterproof are a must. Look for a pair that come with a set of liners and/or have a zippered opening on the top to insert a set of hand warmers. Avoid mittens. They're awkward, especially when trying to switch gears and/or use the hand brakes. Neoprene booties that fit over biking shoes will help to keep your feet warm. Some booties are thicker than others and some have varying thicknesses of insulation. Wear wool socks. Foot warmers also will keep your toes toasty. Use brightly-colored, eye-catching clothing. The goal is to be seen. Motorists don't expect to see bicyclists during the winter, so get their attention before they get yours. Wet weather decreases the life of brake pads. Inspect them every week. Use tires with a good tread. Keep your chain clean and lubricated. Carry a repair kit with you. The hardest part about riding in cold weather is getting out the door," said Greninger of REI. "If you can force yourself to get dressed and get on your bike, you won't regret it." Confluence Cyclery's Smith, a biochemist who earned a master's degree in meteorology and oceanography during his 24-year career with the U.S. Navy, said bicyclists have to be aware of the windchill factor, especially on days when there is no wind. For example, bicyclists who maintain a modest pace of 10 miles per hour in 30 degree weather have to be prepared for a windchill of 21 degrees. If they aren't properly covered up, they could suffer frostbite in 30 minutes. See chart, above. Not riding in the winter? If you store your bicycle for the winter, you owe it to yourself and your bike to give it a thorough cleaning -- or have a full-service professional bike shop do it. • Hose off all the road and/or trail grit and grime. Pay particular attention to the chain, gears, rims and derailleur -- the mechanism that moves the chain from one gear to another. • Clean and lubricate the chain, gears and the derailleur. A light coat of WD40 will protect it for the winter. • Use a large plastic-coated hook to hang the bike from a joist in a dry basement, garage or shed. • If that space-saving option isn't possible, check the tires every week or so and add air when necessary. • If you haven't yet "adopted" a professional bike shop, winter is a good time to shop around -- literally and figuratively. 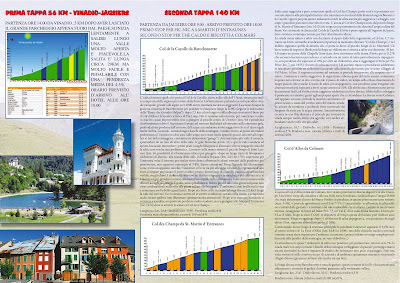 One of the interesting aspects of the Italian cycling culture is the existence of fan clubs for professional riders. 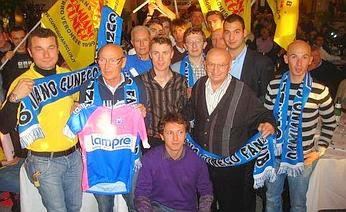 The Damiano Cunego fan club recently had their annual dinner with the rider who hails from Verona province. At a restaurant in Peschiera del Garda, 300 fans ("tifosi"), coming as far as Normandy, came together to celebrate Cunego's 3rd victory at the Giro di Lombardia and a silver medal at the World Championship in Varese. Cunego also raffled a Wilier bicycle, the proceeds which would go to a mission in Ndithini, Kenya, that assists woman and children afflicted with AIDS. Sunday, November 16th: I decided to ride from home to the ride start in Clinton, NJ. It was a nippy morning, 38F when I left home. I stopped in High Bridge to take a photo of the small Veteran's park, where the flags were being whipped around by strong winds, followed by a stop for espresso in Clinton before joining the group that would be 9 riders. My friend Lee, whom I've been riding with for nearly 20 years, planned the route that took us through Hamden, Pittstown, Quakertown, and Cherryville. We were constantly buffeted by winds of up to 30mph. It's a funny thing about wind: it's rarely to your back! Although I would have preferred to ride under sunny skies, the cloudy sky was beautiful. Friday, November 14: Despite not being able to see past my nose I decided to try to go for a ride. The day was warm so, "Why not?". The ride didn't last long as only about 3 miles (5Km) from home I was caught in a downpour. I hightailed back home, cleaned the bike, setup the old Blackburn trainer I have, and rode for one hour on it. Next: set-up the old rollers that I have. I've never ridden rollers. 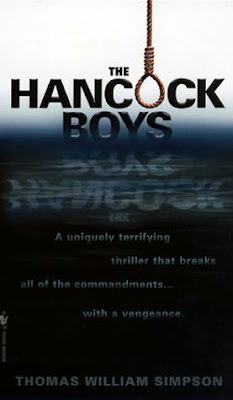 From what I've read it's going to be an interesting experience at the outset. My friend Paolo from CHESINI of Verona, Italy, sent some photos of two of the latest Columbus SL builds they have completed. I notice that they used a new type of fork, straight, in the build of the metallic rose bike. Search for CHESINI within the blog for additional photos. 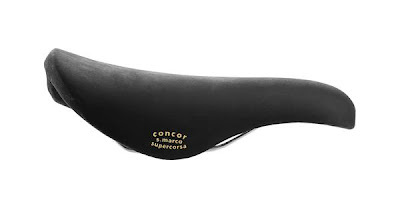 Selle San Marco, the Italian saddle maker, is bringing back 3 vintage saddles into production: REGAL, ROLLS, and CONCOR. 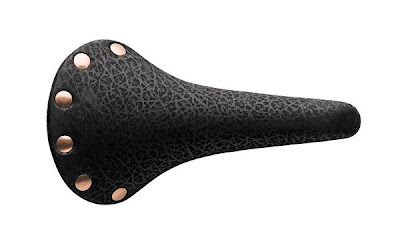 These saddles will be available in a number of different colors, and some with titanium rails. 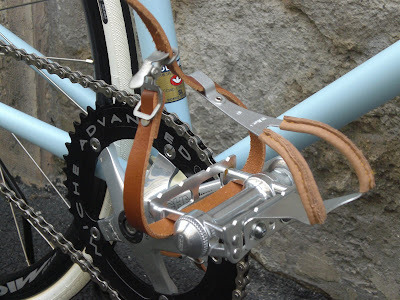 See http://shop.sellesanmarco.it/ and navigate to "Vintage 1935 Collection" (note: 1935 is the year Selle San Marco was founded, not when these saddles first appeared). I mention all of this because Regal saddles are my favorite. Paciotti is an Italian shoe designer. Does anyone know what kind of bicycle this is? Tuesday, November 11th: The temperatures are dipping below 32F (0C) in the early morning hours and the leaves from the trees have fallen. Winter, as I recall it, is on its way. Today I was trying a new winter cycling jacket, hoping it will keep me warm through the next few months. Before living in Verona I would usually hang up my bike by this time of the year but living in Verona showed me the benefits of riding year-round. 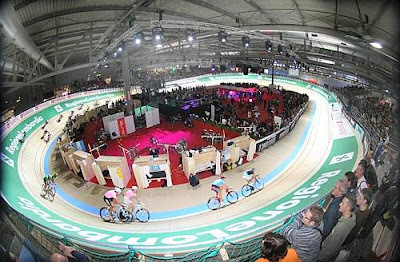 Italy’s Paolo Bettini ended his professional cycling career with a final victory on Sunday, winning the Milan Six-Day with partner Juan Llaneras of Spain, held in the halls of the EICMA Milan show. Bettini crashed heavily during the opening day of racing and was taken to hospital but got back up and continued to race so he could enjoy his final race in front of the hundreds of tifosi in the stands and with his family and friends cheering from the track center. Bettini and Llaneras pulled back three laps in the final two days of racing on the 166 mt track. They had slipped to second place before the final Madison but then stormed to victory with an aggressive final ride, beating Filippo Pozzato and Luke Roberts by just a few points. Olympic Madison champions Perez and Donadio finished third. 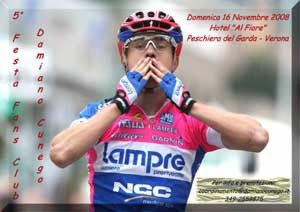 The final day of racing was an emotional send off for 34 year-old Bettini. He was cheered for the crowd during the winner’s ceremony and was close to tears as he realised it was his last ever race as a professional. Bettini will now dedicate his time to his wife Monica and daughter Veronica. "For me, being here is so emotional, in front of all those friends and supporters. I strongly wanted to keep the word with "6 Giorni"'s organizers, and it's a great pleasure closing my career here in Milan. Now I will also commit in rallies, next week I will be a navigator on a Peugeot. It will be another intense experience". During his successful career, Bettini rose from the role of domestique to become the most successful classics rider of his generation. 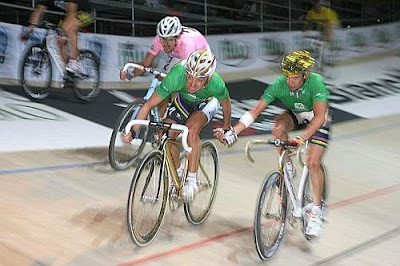 He won almost all of the cycling’s biggest one-day classics and won the Olympic gold in Athens in 2004. He won back to back world title in 2006 and 2007 and his last road race was rightly this year’s world road race championships in Varese. NJ: "Ride to Carpentersville via Riegelsville"